It’s a good thing most people in LA don’t realize that the word “mian” simply means “noodle(s)” in Mandarin, or else they might just write off the restaurant Mian in San Gabriel as some sort of Noodle World or Noodle and Company knockoff. Fortunately, Mian is anything but. 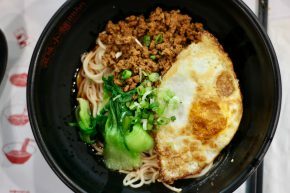 Like Chengdu Taste before it, Mian represents the Sichuan (or Szechuan or Szechwan) region of Chinese cuisine.